Haute Whimsy: Back to Outdora! As the weather here in southern California continues to be somewhat erratic (with snow threatening downtown Los Angeles of all places- can you believe it?! ), I couldn't help but find myself back at the Outdora website in search of Springtime/Summertime outdoor goodies. Joe and I have been secretly planning a move from our little condo with a simple balcony to an actual house with a big backyard later this year, and it has me all aflutter. I've been daydreaming about outdoor kitchens so we can host fabulous parties for our friends and family. 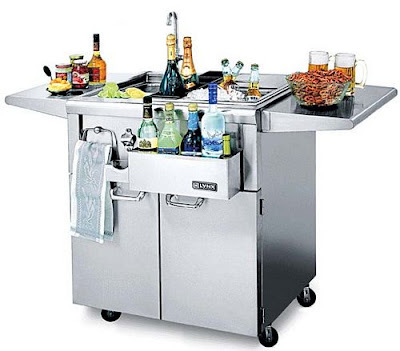 I'm pretty much drooling over the wine refrigerator and cocktail station. Home bartending during the summer months is a tradition amongst my friends. Why go out and spend a fortune on drinks and cab rides home when you can have full control of your party beverages in your own backyard?? I have been devising different sangria recipes that sound perfect for the hot summer months ahead. Not much is better than a glass of fruity wine in the backyard, lounging on a comfy patio chair. Do you have any favorite icy drink recipes? But while I allow myself to get carried away with the entire outdoor kitchen idea, Joe has his preference narrowed down to a BBQ grill. He's a master bar-b-quer and makes the most amazing slow-cooked Santa Maria BBQ with grilled veggies and grilled fruit. Unfortunately, our current grill has seen a few too many summers and is about to meet its end. I suppose I can concede and let Joe take the first big purchase for our new home once we're settled in!